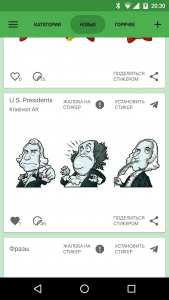 Stickers’ catalogue was created for quick searching and installation of stickers in the Telegram. All stickers in the app are free! A large catalog that weekly updated with new sets of stickers. Stickers are sorted by category. Add stickers to your favorites for quick access to them. Send us new stickers and we will add them to the database. ← Каталог стикеров для Telegram теперь на французском и испанском языках!